A few of my friends, fellow ETA’s stationed in Rheinland-Pfalz, stayed with me the night before the Fulbright conference started. They arrived quite early on Saturday morning, and so we decided to do a bit of Berlin sight-seeing in the most unexpected way: by going to two parks semi-close to me. 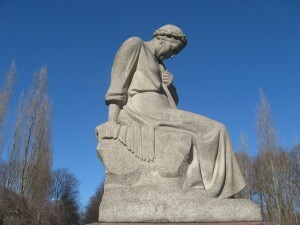 My flatmate, P, had continually nagged me about not visiting Treptower Park. 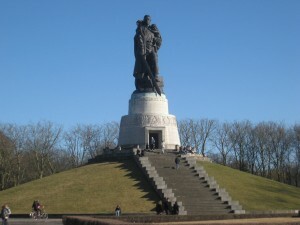 He told me to visit the Soviet War Memorial there, not least of all because he had never seen anything like it before. Hhhmmm….a war memorial in a park? This could be interesting. I decided to take the girls to a park or two simply because Spring was just around the corner when they arrived. I wanted to take advantage of the good weather in case it disappeared the next day, which had been the pattern in Berlin for a couple of weeks before. The verdict? I absolutely loved the memorial (please, don’t tell my Dad). I know it’s a Soviet memorial and to boot, one commemorating Soviet soldiers in a battle in Berlin shortly before the end of the Second World War, but I was so reminded of home throughout the entire tour of the memorial: from my first glimpses of the use of space down to the larger-than-life statues. I felt like I had just stumbled upon a Soviet version of Washington D.C. (blasphemous, I know). 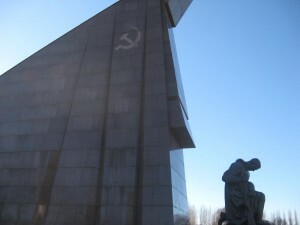 Nothing more nationalistic and over-the-top than a Soviet war memorial, I tell ya. It was so well-done. It intrigued me that it scared my flatmate, but when one is an American, one is used to…well…simply put: over-the-top monuments honoring our soldiers. The reverence shown by the the simple, plain woman by kneeling to the statue of the Soviet soldier, in all of his dignity, protecting the child in one arm with a massive sword in the other was very moving? Awe-inspiring? (I’m still puzzling over my feelings about the memorial. I just know that my feelings aren’t negative.) If anything, the monument is a testament to the ideology at play during the Cold War and I’m a big fan of history during the 20th century, so my thirst for seeing war-related monuments and memorials was quenched that day. The most interesting aspect of the memorial was how people used the space. It was very quiet, peaceful and many tourists and locals were there that day. The tourists took in the grandiose memorial while the locals were either jogging, taking a nice stroll through or, wait for it, reading a book and studying for class on the steps leading up to the Soviet soldier. That’s right…I spotted two students studying there (not together though). I did a double-take at that sight. The look of horror on P’s face when I told him how much I loved the Soviet War Memorial was priceless. I can’t wait ’til he visits me in D.C. 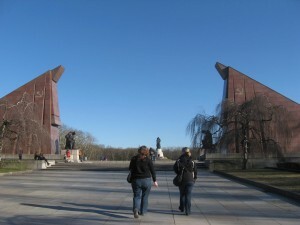 This entry was posted in Jill Nguyen '10, Fulbright to Germany and tagged Soviet War Memorial, Treptower Park. Bookmark the permalink.